Achieve New Levels of Sales Performance...All it Takes is BRAIN-Based Training. Would you be willing to spend a day learning a system unlike anything you've ever experienced if it were guaranteed to bring you to a dramatically higher level of success? The Switched-On Selling™ Seminar is an exciting new concept for improving your sales. It is so different, so unique, and so amazingly powerful that master sales trainers and sales managers who have taken the class are urging others to attend. "This should be a required seminar before anyone takes traditional training," says Andy Miller of the Sandler Training Institute in Virginia, "you have found the missing piece!" William T. Brooks, president of a multi-million dollar sales training company, says, "I would very strongly recommend the Switched-On Selling seminar." And Robert Donovan, Director of Sales at IOF Foresters, says, "The Switched-On Selling experience had the greatest impact in the shortest period of time of any program I have seen in my many years in sales management." In fact, the prestigious National Association of Sales Professionals has found Switched-On-Selling™ to be so effective that it has officially recognized the seminar as an accredited course. This course has been hailed as a breakthrough experience by thousands, and now you too can learn the easy-to-do-, powerful Brain Gym® system, which no other book or sales training incorporates. Brain optimization expert Jerry V. Teplitz, J.D., Ph.D., and top sales guru Tony Alessandra Ph.D. are Fortune 500 Educators and powerhouse sales training pioneers. This course combines Dr. Teplitz' breakthrough application of the Brain Gym® technology with the street-smart sales strategies of Dr. Alessandra. A number of customers have sent in reports of doubling and even tripling their sales. Read their success stories here. The Switched-On-Selling™ Seminar is revolutionary because you are not taught a single sales technique during the entire day. Instead you will learn a system of easy movement exercises called Brain Gyms®. (Click here to read 19 years of Brain Gym® validation research.) Exercises are specifically targeted to 'switch on' communication between your left and right brain hemispheres. And when you 'switch on' communication in your brain, you achieve new levels of energy and peak performance and feel a new sense of emotional well-being. What's more, the Brain Gyms® you will experience start working immediately. As Master Sales Trainer William T. Brooks discovered, "this one-day seminar will eliminate your personal barriers to being a more successful salesperson." The Switched-on Selling training program validates the amazing and positive successes of seminar participants with research. Dr. Teplitz has conducted studies of almost 700 salespeople who were asked to respond to 18 self-evaluation questions immediately before and after taking the seminar and again one month later. You can review the entire report here. Their responses showed that this 8-hour seminar brings about immediate benefits...and the results are lasting. One client even proved it for themselves! If any of these sound familiar – or if ANYTHING else is holding you back, then the Switched-On Selling Seminar will have a dramatic and immediate impact on your sales and bottom line. In the Seminar, you will experience the proven Brain Gym® exercises that make personal change easy, fast, and lasting. I'm so confident about the immediate changes you will experience that I'll give you a 100% money-back guarantee. If at the end of the day, you feel you haven't received your money's worth, I will gladly refund it to you with no hassles. How Would You Like to Experience a Switched-On Selling™ Seminar? Become a Certified Switched-On Instructor! Click Here if you're interested in training to become a Certified Switched-On Instructor. I am interested in Sponsoring a public seminar. Please contact me. I am interested in arranging an in-house Seminar for my Company. Please contact me. 80-20 Rule No Longer Applies - SOS Was Only Variable Changed and Results are Incredible! “Before we got ‘Switched-On,’ we thought that the 80-20 rule—80% of sales are made by 20% of the sales force—was going to plague us forever. But immediately following the Switched-On Selling training, we found that all of our salespeople were achieving higher closing rates and greater profitability per sale than before. The SOS training is the only variable that changed in our sales team’s training and the results are incredible! Our average salespersons’ income increased by 19%. We achieved our aggressive sales goals and have been nationally recognized for attaining one of the greatest percentage of increases for two of the product lines we carry. Everyone’s earnings are up and so is morale! "The day after the seminar the results were instantaneous. We closed 7 contracts, more than we had done during the preceding 8 months. By the end of the week, we had 18 signed contracts." "Before I completed your course, I was averaging one insurance sale a week, then afterwards it went to 2.5 sales a week. After five months of maintaining this level, I changed companies and my sales increased even more dramatically. After my first five weeks, I was the top agent in the office." "I'm just as ‘switched-on’ now as I was the day of the seminar! And being 'switched-on' has benefits in all of my life, not just in sales. It has given me a strong, solid, quiet, internal confidence …100% confidence." "I took significant action in overcoming one of my weakest areas-cold phone calling. As a result of this seminar I also had my two best months of sales ever immediately following the seminar." "I received great benefit from the course. I totally reorganized my home and office. I am seeing more people, making more calls, re-evaluating and writing down my goals. I feel clear about what must be done to succeed." "In the six months since I began practicing SOS techniques, I've gained control and balance in my life. My real estate business has grown to the point of a new partnership in Commercial Real Estate." "I believe all professional salespeople need this course." "I was able to shift to a positive attitude about selling." "I feel more comfortable with cold calls and proposals. I am now confident I can sell whatever I choose to!" "From selling terror to sales excitement in one day! Totally amazing! I can hardly wait to get out there!" "I have been involved in the Life Insurance Industry for the last eighteen years. One of the main challenges I have faced all this time is "call reluctance", (fear of the phone). The "Switched-On Selling" Seminar I attended had an immediate and profound impact, in that 'call reluctance' is no longer an issue. The results have been incredible! Thank You!!" "The Switched-On Selling Seminar was outstanding, and judging from our staff evaluation forms, they all thought so as well. The best part about the training is that results are instantaneous. SOS is an entirely new approach to sales training and one our group enjoyed and embraced. Thanks!" "I got my sense of confidence back. I feel like I can resume the life I put on hold back in 1991. I would definitely recommend this seminar to others." - Robert Gray, President, 3R Environmental, Inc.
"I took your Switched-On Selling (SOS) course and I have to say I noticed a profound change in my attitudes, actions and abilities with selling. I have been certified to teach the BEST for learning series for 8 months and I have not had a single student sign up. Right after your training program I made a deal to teach someone the BEST for learning series, in exchange, he is setting up a class of 40 students for me in Ireland. Then I set up a class for SOS in Florida for 6 people with a possibility of expanding it to 12. The next day I signed up 3 people to take the BEST class, and 1 for a local SOS class. The day after that I signed up 1 more for the BEST class, 1 for the SOS class, and a new massage therapy client. The next day I signed up 1 more for the BEST class and 2 more for the local SOS class. All without difficulty or compromising on price. I went from being too afraid to set up a class to doing what I have been wanting to do all along, with no effort." "As you may recall, my reason for taking your "Switched on Selling" Seminar was to try and overcome my call reluctance that I had struggled with for over eighteen years. It became necessary to "get on the phone" and book appointments for presentation. The ease with which I was able to make those calls and the positive responses that I received from the people I was calling was truly amazing. Literally a 100% positive response to the calls made, all appointments booked and presentations completed. This Seminar has completely changed my feeling of self-esteem and self-worth and is quite vividly evident in the response I am getting from the people I am contacting. I would recommend that anyone and everyone be encouraged to take the Seminars you offer because they are literally 'life changing' and will produce noticeable positive results basically immediately." "My sales tripled after taking your class!" "I feel much more relaxed about selling and notice an inner confidence that's just 'there'. I'm setting my goals more consciously for selling each day and feel wonderful about it. Excellent material!" "Two full months after the seminar, I can still strongly feel its positive effects on my sales approach." "Prior to Switched-On Selling, setting goals was difficult. Since the workshop I easily set my goals and I review and visualize them daily!" 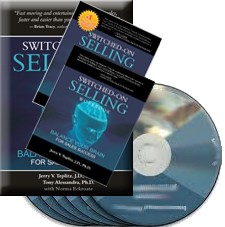 "Thanks for the "Switched-On Selling" course - it has really helped me. I followed through with the exercises and really felt when things switched over for good. Now if I start to slip a little, the exercises kick it back in quickly. This has been very effective for me and I continue to learn and work with the process. Thanks again!"